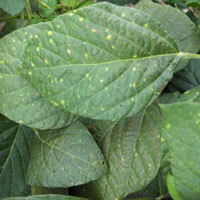 Symptoms of downy mildew are typically found on the upper surface of young soybean leaves. 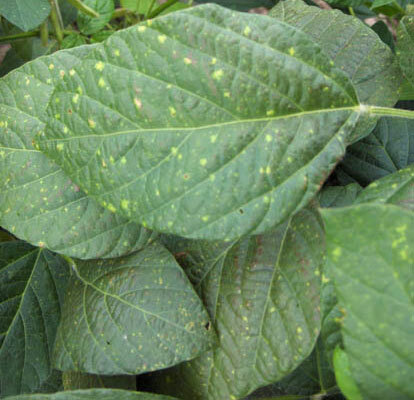 Downy mildew is a common fungal leaf disease of soybean that occurs wherever soybean is grown, especially when weather conditions are rainy and humid. The downy mildew pathogen, Peronospora manshurica, survives in crop residue and on the surface of seed. The pathogen is in the same group of oomycete pathogens that cause Phytophthora root rot of soybean and late blight of potato. Like those other pathogens, the pathogen that causes soybean downy mildew has swimming spores and needs water or high humidity for infection. Spores are carried onto plants by wind and rain and infection can spread quickly through a field during periods of cool, wet or humid weather. Although common, downy mildew rarely causes yield loss from leaf infection. 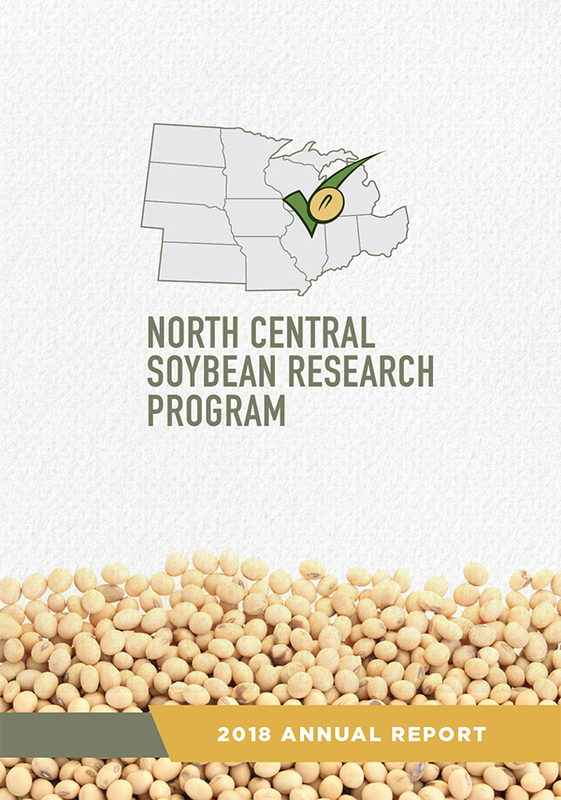 Epidemics have occasionally occurred in the Midwest, causing yield losses of 9 to 18%, depending on the soybean variety planted. Downy mildew is carefully monitored during the development of new soybean varieties, especially when new sources of soybean germplasm or transgenic technology is used. This is because the downy mildew fungus is a biotrophic organism, which means it can grow and reproduce only in association with the soybean plant. Because of this very close relationship with the soybean plant, it is capable of rapid genetic change in response to genetic changes in soybean, and many different races of the downy mildew pathogen exist. Downy mildew is very weather-dependent and is most likely to occur during periods of cool, wet weather. Younger leaves are more susceptible to downy mildew than older leaves, so the disease will generally appear first on the upper surface of young leaves. Look for pale green to light yellow spots which enlarge into pale to bright yellow spots. The center of the spots eventually turns brown, bordered by yellow margins. Check the leaves for signs of grayish to pale-purplish spores on the lower leaf surface during humid weather. The presence of this sporulation is diagnostic for downy mildew. If in doubt, place the leaf in a plastic bag with a moist paper towel and examine again for sporulation in about 6 hours. Some soybean varieties express mild leaf distortion that may resemble symptoms caused by common soybean viruses. Pods can also be infected without obvious external symptoms. Infected seed has a dull white appearance and is partially or completely covered with a pale coating of fungal spores which can be confused with white mold. Fungicides are not recommended for control of downy mildew because the disease rarely reduces yield. Implementing cultural controls to reduce the risk of downy mildew is generally all that is needed. Plant clean seed. Plant certified, disease-free seed. Do not plant seed from infected fields. 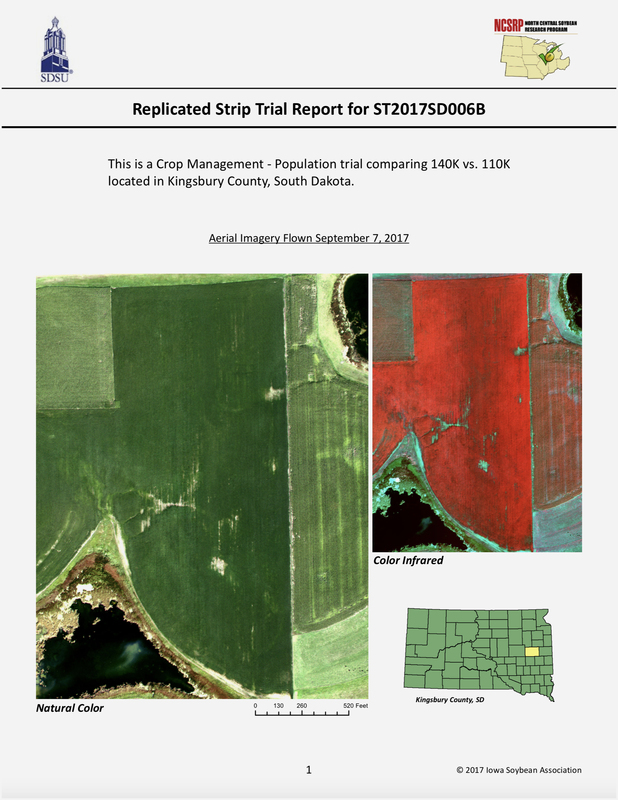 Rotate crops and manage crop residue. The downy mildew fungus survives in crop residue and on the surface of seed. Longer crop rotations, tilling crop residues after harvest, or shredding soybean straw with a combine-mounted shredder will reduce disease risk. Consider variety resistance. Soybean varieties grown in the Midwest are rarely characterized for downy mildew resistance because the disease is considered to be a minor one. However, numerous sources of resistance to P. manshurica are present in soybean germplasm, and soybean variety reaction to downy mildew ranges from susceptible to resistant to specific races of the pathogen. No variety is resistant to every race of P. manshurica.